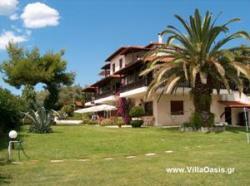 VILLAS AND APARTMENTS TO RENT IN HALKIDIKI, GREECE. 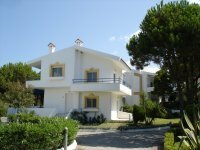 Welcome to our selection of holiday homes to rent in Halkidiki, Greece. Halkidiki is also known as Chalkidiki, Chalcidice or Chalkidike and is situated on the peninsula region of northern Greece. The capital of the region is Polygyros, which is located in the central area of the region. The region has five subdivisions and these are as follows: Aristotelis, Kassandra, Nea Propontida, Sithonia and lastly Polygyros. This region of Greece is home to the Cholomontas Mountain, which is covered by thick oak forest and is part of the Natura 2000 network. The region has many summer tourist resorts, all of which lie on one of the three fingers of the peninsula. The eastern finger of the peninsula, where the monastic community of Athos is, is also known as the Holy Mountain and visitation rights are strict; men can apply, but must do so six months in advance of the actual date and under no circumstances are women allowed. The beaches along the fingers are postcard perfect, pristine sands with clear crystal-like blue waters. This region of Greece is not only stunningly beautiful; it also has everything you could ever want or need from a holiday destination. If you prefer the quieter life and want a more relaxed holiday, then head for Sithonia, but if all out fun and nightlife is your cup of tea then Kassandra is the place for you. There are many things to see and do in the region; following are just a few examples. In Kassandra there is the cave of Petralona, this is where a 700-year-old skeleton was found and is a typical stalactite cave. Nea Fokea is the place where the apostle Paul is said to have stayed and here you can see the Tower of St Paul, as well as the holy well of the apostle and a monastery. If ancient temples are your thing, then head to Kallithea�s archaeological site, this is where the temples of Zeus and Dionysus once stood. Looking for self catering holiday accommodation in Halkidiki? 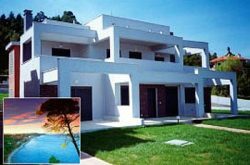 Then below is a selection of apartments in Halkidiki and villas in Halkidiki that can be rented direct from their owners. You can either click on each listing for further details or you can use our search engine on the left if you are looking for something in particular. The peninsula of Halkidiki is covered in pine and olive forests, with sandy golden beaches with rocky headlands, coves and caves with crystal clear, clean blue water. Not far from Petralona, a village, there is an extensive cave complex that extends and spreads over a 1900 metres, offering a unique trip. The ancient city Olynthus is split in two over separate hills, on the south hill is the old settlement whilst on the north hill lays the classical town. Olynthus is home to two mosaics, which are thought to be the oldest known in the ancient world. The two hills stand at around 30-40 metres, and flatten out towards the top. The modern city lies on the western side of the river Olynthios, across from the ruins of the ancient city. Greece is a very mountainous country and Halkidiki is no different. You have the Mount Cholomon, which covers almost all of the central and east side of Halkidiki, standing around 1,150 meters high making it the highest point and the best view in all Halkidiki. You also have the �legs� of Mount Athos and its monasteries, which spread through eastern side of Halkidiki, and into the Aegean Sea. Halkidiki beaches are as beautiful as the rest of it, and given the vast size of the coastline finding a quiet, empty beach won't require much effort. Having very little rainfall per year it has sunny days for 300 days out of the year, so finding time to spend at the beach will be easy. Due to the dense amount of nature in Halkidiki, hidden coves, caves and lakes are popping up all the time. The Cave of Petralona has become famous after an archaeological team found the oldest human skeleton ever found in the cave, which was 700,000 years old. It has since become open to the public and has become a popular visiting place by tourists, although photographs and video isn't allowed due to various lights and flashes could cause damage to the interior part of the cave, as well as the stalactite and stalagmite. Hilkadiki has no Airports, so travel to it from a nearby one is necessary. The nearest Airport to Hilkadiki is located in Thessaloniki. The capital and main town of Halkidiki is the town of Polygyros. The largest towns are Nea Moudania and Nea Kallikrateia, along with the main town Polygyros. The town of Kassandra has now matched up to the other cities, after it merged with Pallini in 2011. Halkidiki is a peninsula, which is located in northern Greece, on the Mediterranean coast. Due to its location it�s always fairly warm and sunny, with Halkidiki itself being known for being sunny nearly all year round.